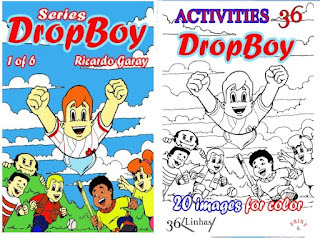 Dropboy is a series of books, where the title character becomes liquid, and gets involved in many adventures. He defends his friends - Andy, Takao, Anny, and Roa - from the fumbling villain - Doc Folly, his henchman Roig, and the bats Frit and Frat. Many action-packed adventures, with a unique message - friendship above all else. The Travels of Flip Flap - two bubbles of soap take trips to the city, farm and sea - and discover angels. Four free activity ebooks with five images each to colour - Dropboy, Flip Flap, Little Adventurers, Little Guardians - and four free ebooks to read. PLUS... three online games to play based on the books!